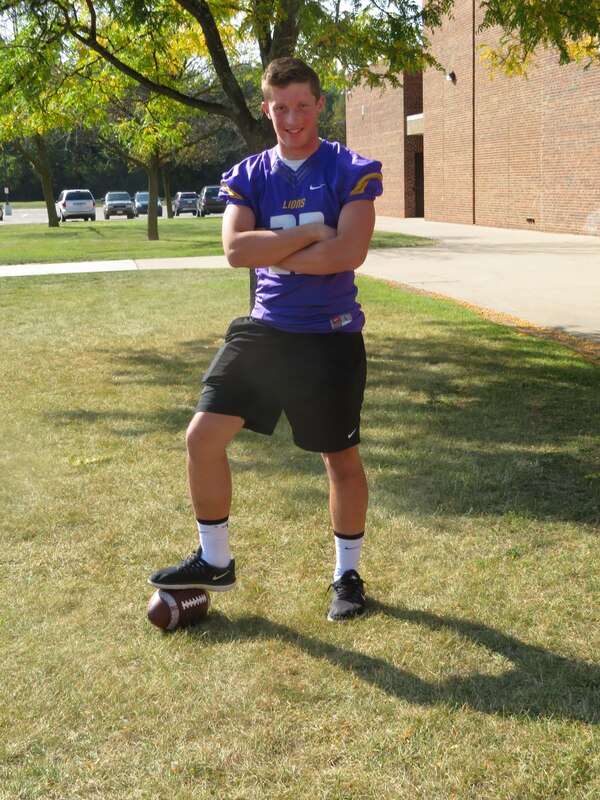 So far New Berlin Eisenhower junior Jack Himmelspach has finally had a chance to show what he can do with a football in his hands. Himmelspach tops the Woodland West first-place, state-ranked Lions in rushing through the first 6 games and is a key part of their running attack. He began his football career as a youngster and couldn't play running back because he was too big and there are weight limits in the junior program. 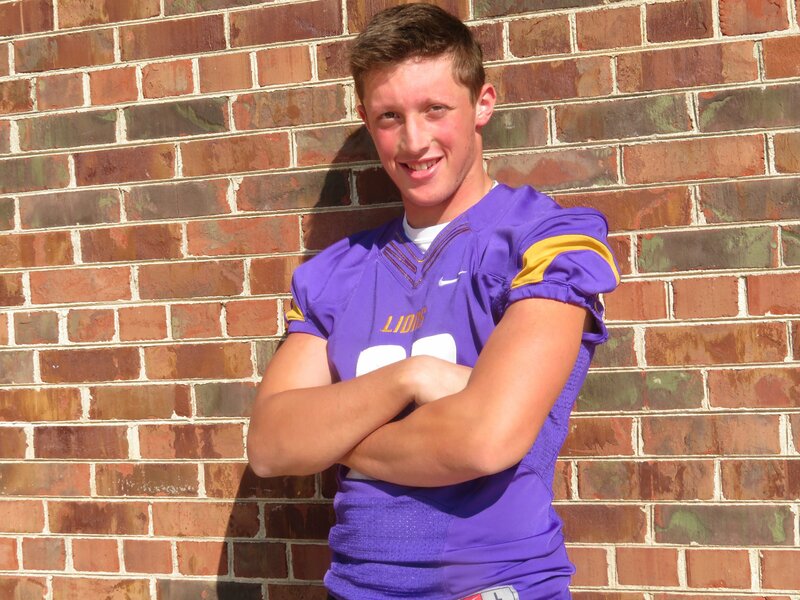 But currently at 6-feet, 2 inches, 195 pounds, Himmelspach has finally taken advantage of the chance to play running back and it is paying off for the Lions. And Lions head coach Matt Kern has been pleased with the results. "His style has really been a great addition for our team," Kern said. "I think if you look at our team the last couple of years, we're known for a very good passing game. We've got good players at the skill positions on the perimeter. Joey Scaffidi was our main ball-carrier the last couple of years and he was a very talented kid, but just built differently. "So we knew with Jack our running game was going to look different. We didn't know quite how different it would look, but we're seeing as the year goes on we're having a more 'power' type back. It's giving a really nice compliment to the rest out our offense." Himmelspach has carried the ball 35 times more than the next runner and he has 487 yards rushing - a 6.8 yards per carry average - and 7 touchdowns. He has been a consistent performer for the Lions, but had 3 games that have stood out so far. In a huge 38-14 win over Pewaukee, Himmelspach rushed 21 times for 141 yards (6.7 ave.) and a touchdown. In a 31-0 win over Greendale he rushed for 118 yards in 19 carries (6.2 ave.) and 3 touchdowns. Against crosstown rival New Berlin West he rushed 9 times for 93 yards (10.3 ave.) and 2 touchdowns. Photo by Tom "Sky" Skibosh - Junior running back Jack Himmelspach led New Berlin Eisenhower in rushing through the first 6 games of the season. He has been an excellent complement to quarterback Bryce Miller, who has 10 touchdown passes and running back Jake Belongia who is a dual threat with 7 rushing touchdowns and 4 touchdown catches. Leading wide receiver Steve Halusan also has 4 touchdown receptions and leads the Lions with 22 catches. Kern explained some of Himmelspach's strengths as a running back. "He has an underrated ability to make the first guy miss," he said. "I think he is seen as a straight-line runner, but he has a little shiftiness to him in the hole that shows up on film. He very rarely loses yards, even when he's hit in the backfield. And if it's a play that's not blocked the way we want it to, he will usually get a couple yards out of it. He's almost always falling forward and that is something you are looking for. He can turn 3-yard runs into 5-yard runs with a little extra effort at the end of plays. "When a hole has been there, he hits it hard. He finds the hole. He's got really good vision. He's more of a natural for the position than we thought he was last year." Himmelspach got into organized football in third grade with the New Berlin Generals, but he played guard, tackle and center because he was too big to carry the ball. "Running back, I like it a lot," he said. "From third grade on I always wanted to play. I would try to cut weight so I could play it." Himmelspach stuck with the game and he explained his thought process as he developed physically. "Overall it was the team aspect of it," he said. "I was never overly athletic until 7th and 8th grade. My teammates - I had been with the same guys since third grade essentially - that's probably best part of it for me." Eisenhower runs a spread offense, a running back and 4 wide receivers. "It's not one offense, it's like a complex thing," Himmelspach said. "Probably this year it's been mostly passing. But we knew if we have enough success on the ground it would help us. I can also catch the ball since I have also played tight end. I've had experience catching the ball back at the beginning of 6th grade. I was one of the bigger eligible guys, so they played me at tight end." But Himmelspach didn't hesitate when asked what part of being a running back he liked best - blocking, carrying the ball or catching the ball. "Carrying the ball," he said. "I like to kind of take on the contact. I don't shy away from contact like some guys who run out of bounds and you end up losing yards. I like to lower my shoulder, get the guy on the ground and get the extra yard. That's something I've been trying to work on this year, more than every other year. Taking the hit and delivering the hit too. I would probably make a move, but decide what would have the best chance of breaking the tackle." Being a junior, Himmelspach was asked what he wanted to get better at. "I would like to get a little stronger," he said. "My agility, that's something else I need to work on. Being able to run through people can get you only so far. So I need to get some speed and agility in there." "I think it's (leadership) is really important," he said. "(If done correctly), the young guys will feel that they are really a part of the team. We'll work together and accomplish so much more in the end. Photo by Tom "Sky" Skibosh - New Berlin Eisenhower junior running back Jack Himmelspach is finally getting a chance to carry the ball and the results have been excellent. Kern, on the other hand, hesitated when asked what Himmelspach had to work on. "I don't know if there is anything that stands out at this stage," he said. "We'll sit down and start talking to him about goals for his senior season. We'll want him to be a bigger part of our defense next season. He could definitely help us on defense but we have the luxury of letting him play offense and save his energy there. "A true two-way player next year is something we'll put on his plate. Also just continue to improve as a receiver. He already is a pretty good receiver, but we just don't need him in that role. Next year we might ask him to catch more balls. That's something we'll ask him to work on." Kern looks back and recalled Jack's early years. "He did a nice job for us at the youth level, so I knew of him at the 7th and 8th grade level. But it was not a running back until last year. He had a great season as a JV running back last year so we were watching him closely last season. We knew he had a chance to be a nice player for us at the varsity level. "It was happening gradually throughout the JV season, especially towards the end of the JV season - the last couple games it was clear he was a man among boys at that level. We were pretty much giving him the ball on almost every play. We thought this is something we're going to have to take a serious look at next year." The Lions have 5 senior captains, but Jack shared his thoughts on leadership. "I don't think it's (being a leader) limited to being a captain," he said. "The captains are elected by the team, so they're probably the best leaders. But I think anyone can step up to be a leader no matter if they're a captain or not. Some of the guys under the captains are great leaders, some of the linemen. I'm working on being a better leader to the younger guys who are looking up to us." Kern agreed with Himmelspach's assessment. "Most definitely. He's already starting to grow in that role," he said. "He's not a loud boisterous type of kid, but he definitely has confidence. He definitely has the respect of his teammates. I think he will grow nicely into that role next year, I have no doubt about it." Getting back to this season, Himmelspach was excited about the Lions' fast start. "Coach has preached that he's seen teams get to this point in the schedule and they kind of get bored," he said. "Our goal is to aim higher. We've beaten good teams by big margins, now we have to beat lesser teams by bigger margins. Our goal is to keep a higher level no matter what part of the season you're in." Kern then described Himmelspach's development. "That's the nice thing about coaching high school ball, there is always an uncertainty about every season," he said. "Some of the kids who you only see at the JV level, to see them grow so much in just a year. Then transfer all those great things that they were doing at the sub-levels into the varsity level. It's been exciting for us for sure." WHAT DO YOU DO TO RELAX? Play video games ('Madden Football'). MOST MEMORABLE MOMENT: Beat New Berlin West last basketball game on JV. WHAT DO YOU WANT TO DO IN THE FUTURE: Attend college, play football and be a physical therapist.